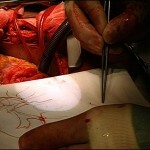 See the video on Vimeo. 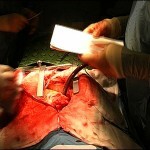 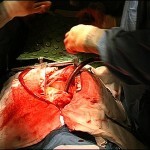 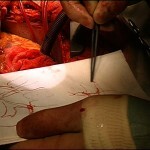 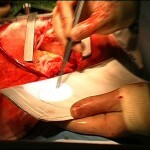 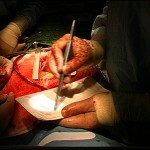 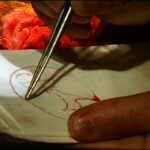 The Swab Drawing videos (2003) document surgeon Francis Wells as he draws using a swab of patient’s blood, during open heart surgery. 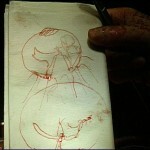 The drawings recall, diagrammatically, mitral valve repair procedures. 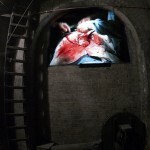 One appears fresco-like, projected directly onto the flaking wall in The Belfry, an art space in a functioning church designed by Sir John Soane in London. 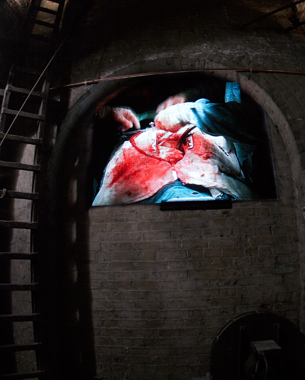 Others are shown on tiny screens between archways.